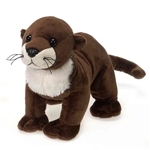 These river otter stuffed animals are long, lean, cuddling machines! 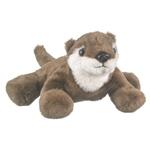 If you're looking for something extra cute then check out these plush river otters! 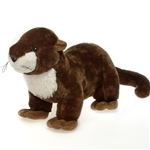 Much like the real thing, river otter stuffed animals love to frolic and play all day long. Read more. Do you know how to tell if an otter is a river otter or if it is some other type of otter, like a sea otter or Asian otter? It's really easy, you ask it! You 'otter' know that! Of course you could go by appearance, habitat range, diet, and several other scientific factors but it is much more fun to talk to an otter. Stuffed otter or real otter, it doesn't matter. Sure, people will look at you a little funny when you say, "Hey otter, are you a river otter? ", but the otter will get a good laugh out of it. Especially if it is sitting in a river when you ask it. If you spend too much time talking to your river otter stuffed animals you might also get funny looks from people. Well, not for talking to them, but if you wait too long for an answer. All plush animals, river otters included, require a certain level of imagination by the interrogator when they are being questioned. Cuddling, on the other hand, is completely mindless and incredibly rewarding. Every one of these stuffed river otters is well adapted to being hugged, snuggled, squeezed, and loved. Just ask them. They'll tell you, if you use your imagination! Shop.